Every December, city engineers set the climate control system to winter mode. She never understood why anyone went to the trouble of creating an authentic holiday environment when it resulted in half a million people freezing their asses off for a month. The temperature stayed a constant one degree below freezing. Flurries wafted down like feathers, created from purified water-ice found in Callisto's crust. Holographic clouds obscured the imitation night sky. She caught glimpses of the dome through small, flickering breaches in need of repair. She zipped up her jacket and buried her hands in the pockets. The tallest building stood twenty stories above the city streets. Shops, restaurants, and far too many smiling people lined her route while she hurried along. She shivered at all the wreaths, giant candy canes, and Christmas trees. A group of off-key carolers assaulted her eardrums. A boy holding his mother's hand pointed at Brooke. "Look, it's her, Mommy!" A trash collection bot strayed into her path. Someone had tied a festive bow around its oblong body. She sent it on its way with a heartfelt kick." Brooke's bad attitude originates from the guilt of believing that she killed her father when he took her flying as a kid. Carolers, presents, and happy people are a reminder of the better days of her childhood, a time she can never reclaim. 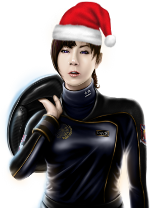 If Brooke were a real person, she'd probably strangle the author for putting a Santa hat on her in the blog post image. Dressing up definitely isn't her thing in the context of the story. Fortunately, she's not real, so the author can make her appear a little more festive without having to sleep with one eye open.